The Kagyu Lineage is an unbroken line of oral transmissions from teacher to student for several hundred years. The present head of the Karma Kagyu tradition is H.H. 17th Gyalwa Karmapa Ogyen Drodul Trinley Dorje. Many great teachers form part of the Lineage; what follows is a very brief historical summary. The lineages of the Kagyu school of Tibetan Buddhism derives primarily from Marpa Chokyi Lodoe (1012-1099). Lama Chime Rinpoche was born near Jyekundo, Kham, in East Tibet and was educated in Benchen Monastery. He received the transmissions of Mahamudra from His Holiness the 16th Gyalwa Karmapa & the 9th Sangye Nyenpa Rinpoche, and Dzogchen from His Holiness Dilgo Khyentse Rinpoche. He was introduced to the essential nature of his own mind by Khenpo Gangshar. 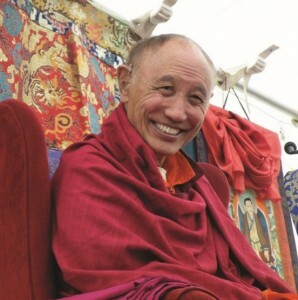 Lama Chime Rinpoche was one of the first reincarnate lamas to come to the West, and has lived in England since 1965. He worked for 16 years as the curator of the Tibetan Language Collection at the British Library in London. Through his profound understanding of modern life Rinpoche conveys in teachings the complete spectrum of Buddhism in a direct, poignant, and humorous, yet vivid style.